Chances are you know someone who is suffering from a severe mental illness, many of them will suffer in silence. World Mental Health Day is held annually on October 10th to raise public awareness on mental health issues worldwide in an effort to promote open discussions on illnesses, as well as investments in prevention and treatment services. People with mental illness have long been stigmatized and alienated. In the 1600s mentally ill patients where viewed as insensitive wild animals. Harsh treatment and restraints in chains was seen as "therapeutic", helping suppress the animal passions. Throughout the centuries varying forms of what would now be considered torture were used to try and "cure" people of their insanity. Although we no longer chain people to walls, or torture them, there is a large amount of abuse of institutionalized individuals by people in positions of authority. And to this day we still treat people with mental illness differently than we would someone with any other illness or disorder. Many mentally ill patients end up incarcerated, and punished instead of receiving the help they need and deserve. For many of these people medication and counseling would make them productive members of society. The majority of drug users and alcoholics have some form of underlying mental illness, and instead of being treated for their addiction and underlying conditions they are incarcerated and then released back into the same environment creating a vicious cycle of addicts going in and out of prison, but never getting better. Beyond the lack of adequate care and treatment programs, many people with mental illness are greatly stigmatized by society. People with mental illness are often treated like people with an infectious disease like the bubonic plague, as if somehow being around "crazy" people will make you crazy. Mental illness is just like any other illness its caused by a chemical or biological imbalance of the body. It's not like we go running scared from people with cancer, asthma or lupus. Mental illness is the same thing, its caused by something that's out of your control, however unlike people with cancer, asthma, lupus or so forth, people with mental illness are ill in the part of your body that realizes when you are sick, making getting treatment all that much harder because the thing (brain) you usually use to seek out aid is itself sick. So if anything we should be cutting people with mental illnesses a break, and just try to help them, because frankly its harder for them to realize that they are sick. There is also a tendency to label people with mental illnesses as dangerous to society, when in reality the vast majority of people with mood disorders are non-violent and tend to cause harm to themselves. 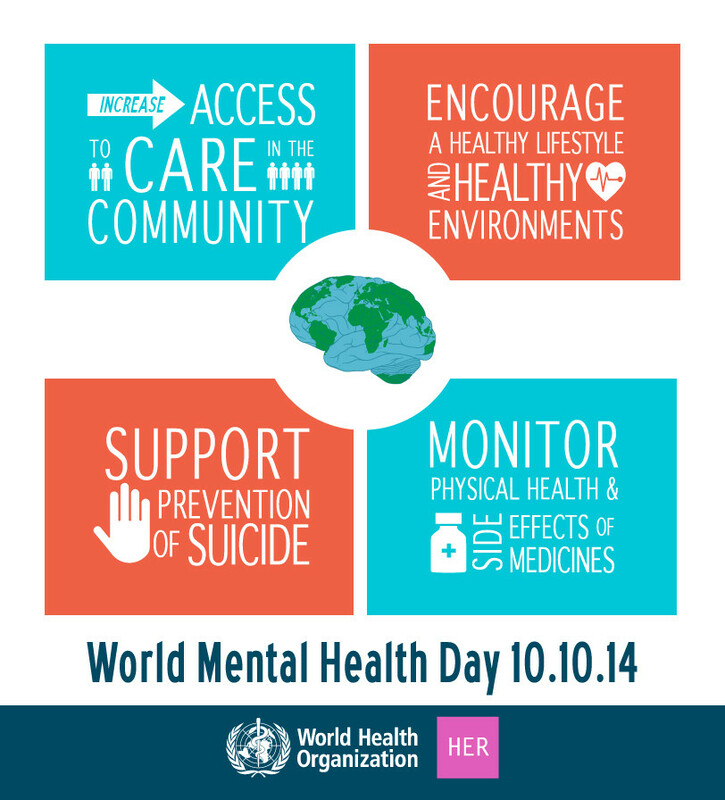 World Mental Health Day allows us to start removing the stigma from mental illness. The World Health Organization suggests a multiple method approach to dealing with the global mental health crisis. Through Social and Health Services and personal responsibility. WHO suggests that people with mental disorders take part in health-care decisions, refrain from tobacco use, eat a healthy diet and go for regular health checks. Health and Social Services need to provide education, housing and employment, encourage a healthy lifestyle and healthy environments, increasing the access to care, support suicide prevention and monitoring of physical health and side effects of medications.